Dorothy “Dotsie” Hoffman works daily at Huntertown-based Hoffman Certified Organics, Indiana’s first and only 100 percent USDA Certified Organic pasture-raised poultry farm. Her sons, Don and Ben, are co-owners. HUNTERTOWN — Don Hoffman doesn’t eat a chicken at a restaurant. “I remember how chicken used to taste. Today, it taste like cardboard,” he said. And the chicken you buy in the stores? “It is just awful. It’s not what I grew up on and prefer,” he said. Don and his brother, Ben, are co-owners of Hoffman Certified Organics, which operates on their family farm at 2606 Chapman Road in Huntertown. Their company is the first and only 100 percent USDA certified organic pasture-raised poultry farm in Indiana, specializing in pasture raised chickens. The Hoffman family has owned the property since 1976, but it sat idle for 35 years until the brothers decided to take on the new venture. Don had raised chickens on his property for nearly 25 years and together with Ben, began the road to organic pasture-raised birds three years ago. The company was incorporated in 2015. “It needs to be done,” Don said. They raise a White Mountain Broiler, which can grow to 4.5 to 6 pounds. The females grow on the lighter end of the scale while the males are heavier. The bird is more popular in Ohio, but has a smaller mortality rate than the cornish crossbird, which is more popular in Indiana. The birds have a 56-day life cycle. The brothers pick up the chicks just after they are hatched from Eagles Nest Poultry in Oceola, Ohio. They are driven back to their farm and are housed in their brooder, where they are cared for with feed, water and an introduction to clover. Over time, the birds will eat less feed and more clover and grass. The organic feed comes from a certified distributor in Wolcotville and the brothers are certified to grow their own organic clover. Once the chicks are about four weeks old, they are moved them from the brooder to the pasture. They are housed in chicken coops — known as “chicken tractors” — to keep them safe from predators. Each tractor is loaded up with water and feed bins and the birds will eat the clover and grass as they are moved up and down the family farm each day. At full growth, the birds are then transported to a processing center in Colfax, Indiana, located halfway between Lafayette and Indianapolis along Interstate 65. There, between 600 and 800 birds are processed in a 3-day period. The first run of 2016 produced 642 birds. They will make eight or nine trips to processing center of the course of a year. Although there are other organic chicken farms in Indiana, Hoffman Certified Organics is the only farm of it’s kind that allows their chickens to be raised outdoors at pasture. It’s location is a fortunate one, with ACRES Land Trust, Issak Walton League and the Girl Scout Camp of Northern Indiana on its borders. Neither described the certification process as difficult, just that it provided a lot of hoops to jump through. 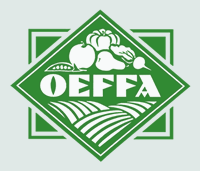 The cost of certification through the Ohio Ecological Food and Farming Agency is $1,300, but the farm was reimbursed $750 through a USDA grant. Water and soils must be tested, a daily feed log must be provided as well as a mortality rate. The farm is inspected on site and the certification must be renewed annually. Hoffman Certified Organics will have its chicken for sale every Saturday at the Fort Wayne Farmer’s Market from 9 .a.m to 1 p.m. near the corner of Barr St. and Wayne St. It is also available at LaOtto Meats and can also be ordered for on-farm pickup. The brothers hope to start a delivery service in 2017. “The whole organic idea is to grow local, be local and know who is raising the birds. Keep transportation and fuel costs low and be environmentally-friendly. That is how we wanted to start,” Don Hoffman said. The company has just three other employees. Don’s wife, Stephanie, runs the office and handles accounting and sales operations. Ben’s fiance, Natalie, handles is the marketing and social media manager. Lastly, the boys’ mother, Dotsie, provides daily help. Don also works for Asphalt Drum Mixer in Huntertown as a steal fabricator, parts cutter and welder and Ben works as a general contractor. They both still find time each day to spend 4-5 hours on the farm, where they also grow organic sweet corn. That, however, is not yet certified for resale. “Chickens is enough for our plates right now, since we still have two jobs. Once we get used to it, we can ease into something else,” Don Hoffman said. And they won’t eat them from anywhere else.